Mentoring is making an investment in the future. By spending just one hour each week with a student and showing your interest in their life, you can increase the likelihood they will graduate from high school and become a contributing member of society. Mentors help identify the gifts and talents of young people that provide them a sense of hope and vision for their life. There are many ways you can support TeamMates and each way makes an important investment in the future. These include becoming a mentor, making a donation, providing in-kind services, being the host site for a TeamMates candy machine, or encouraging your friends and colleagues to become involved. Each mentoring relationship is unique. However, the sessions happen weekly for one hour and the focus ranges from helping with homework, to sharing a hobby or special interest, to simply sharing thoughts and ideas. Each TeamMates chapter is funded locally by donations and the fundraisers that are conducted throughout the year. The average cost to support a mentor/mentee match is $400. The national average $1,000 to $2,000. Who do I contact to become involved? You may contact the program coordinator who leads the program in your community, or the state office at 1-877-531-8326 (TEAM). Click here to find a program coordinator in your area. What are the qualifications for a volunteer? Volunteers who care about youth and are positive role models are encouraged to be mentors. 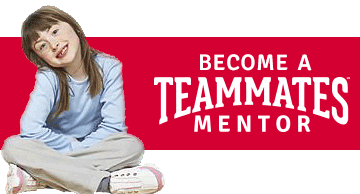 Mentors must be at least 18 years of age and have a high school degree or GED equivalent. Contact your local chapter to see how you can help serve the youth in your community. How can a student become involved? Students can either self-nominate or they are nominated for the program by a caring adult in their life. Typically, this is a teacher, guidance counselor, parent, or community member. Any adult who desires to make a difference in the life of a child by being a positive role model. What age of youth are involved in TeamMates? TeamMates focuses on mentoring youth beginning as early as 3rd grade. Mentors are encouraged to continue in the mentoring relationship until the student graduates from high school. TeamMates is a school-based, one-to-one mentoring program co-founded by Dr. Tom and Nancy Osborne. The focus of the mentoring relationship is for an adult volunteer to help build a positive relationship with a student so as to help them reach their full potential.